Jim Clemens Collection Vol.24: Remembering The Southern Part 2. Jim Clemens Collection Vol.24: Remembering The Southern Part 2 (65-mins). Jim Clemens Collection No.24. 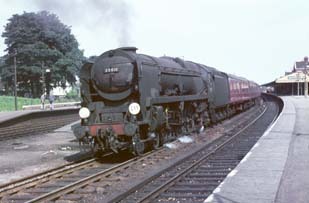 Southern steam film from 1963 to 1966 on the South Western Division covering the main line from WATERLOO to SOUTHAMPTON on general day to day duties from the JIM CLEMENS archive film collection. Included is good coverage of the S15 Railtour over two weekends in January 1966, one on a bright day, the other in snowy conditions on the BENTLEY to BORDON branch, MEDSTEAD bank, ARELSFORD and EASTLEIGH line. Maunsell moguls working BROADSTONE to SALISBURY line in 1963. Visit the ISLE OF WIGHT system for O2s from RYDE to VENTNOR and COWES. BASINGSTOKE with a number of inter-regional trains featuring Western and Midland motive power alongside the many unrebuilt and rebuilt Bulleid Pacifics and Standard types. Cover photo: Jim Clemens, 35011 "General Steam Navigation" at Basingstoke.